Apparently I only make things in threes now, ha ha. 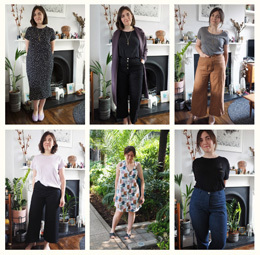 This weekend I busted out three pairs of culottes – all the same pattern but plenty of variation in fabric and detail. This is a vintage pattern that I bought a while ago, I think on Etsy or eBay. It’s from 1984, the year before I was born! 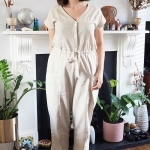 Obviously I was mainly drawn to the kicky button-down options, and I finally dug it out after getting culotte envy both from the sewing community and the high street. 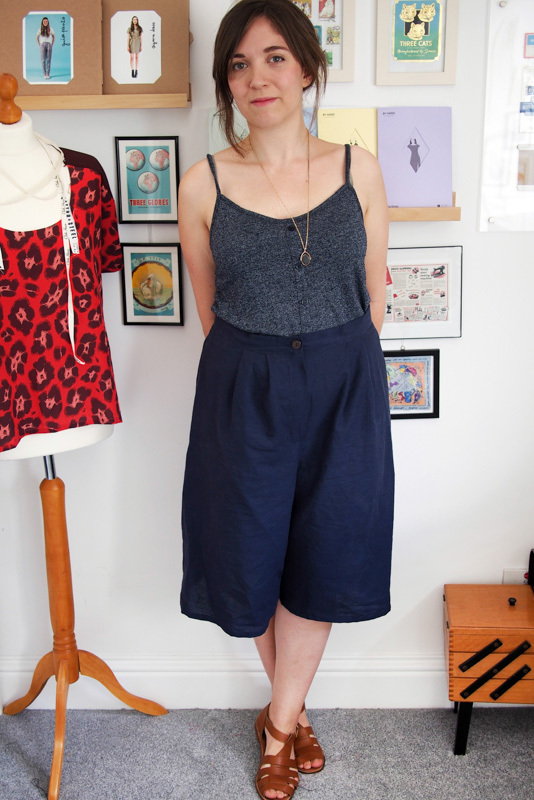 Some in-print culotte options: Itch to Stitch, Style Arc, Burda. I made this wearable toile first, from a mysterious peachskin/suedette from Myfabrics. I bought it with a voucher and it wasn’t quite what I was expecting – less drapey and quite thick and er, quite bright orange! 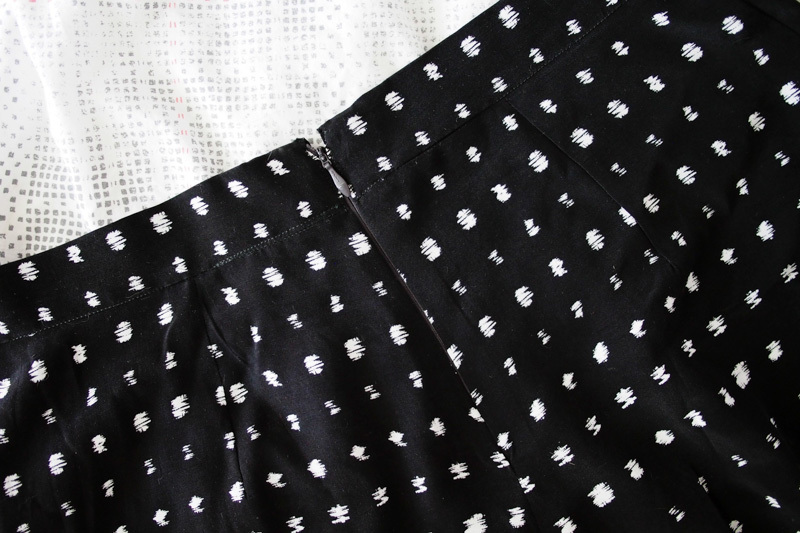 This is view A of the pattern, which has buttons down the centre front of one of the legs, and halfway between the short and long length options included with each view. 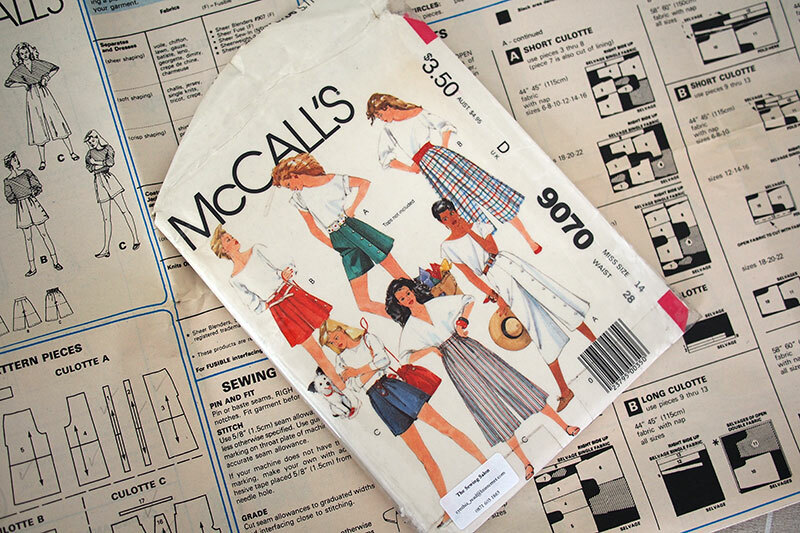 I was really happy with the fit with no adjusting – I must have a vintage-style figure because I rarely need to alter old patterns much at all – and they came together really quickly. But to be honest I don’t know if I’d ever be brave enough to wear them – orange suedette mega-shorts make quite a statement. Maybe if I switched out the buttons for some tonal ones? And handed out sunglasses? Second go, in a really lovely lightweight linen cotton from Minerva Crafts. This is a mash up of views B and C from the pattern – view B’s front pleats and C’s fly front (but I used my own method to do the fly). These are delicious – SO comfortable and way more instantly wearable for me. This third pair is my favourite – view B again, with added slash side pockets and a centre back invisible zip instead of the fly. This is an ex-Whistles viscose which you might recognise from a previous make. I liked it so much I bought more during a recent sewcialist trip to Walthamstow (I think Fiona and Portia nabbed some too so look out for it cropping up, heh). It’s amazing to wear but a bit shifty when cutting – it was an effort to get those rows of scribbly dots nicely lined up all around. Each view was super fast to sew up – like 90 minutes, tops. I typically don’t make many projects with fixed waistband and zips because in my head it seems really time-consuming, but it clearly isn’t really. I’d really like to find some nice drapey solid fabrics (crepe? Sandwashed silk? Any other ideas?) to make more of these because I think I’ll want to wear them all the time. Cool, comfortable and cycle-friendly – what’s not to love? Wow that was quick work! I love all 3, but especially your last version. 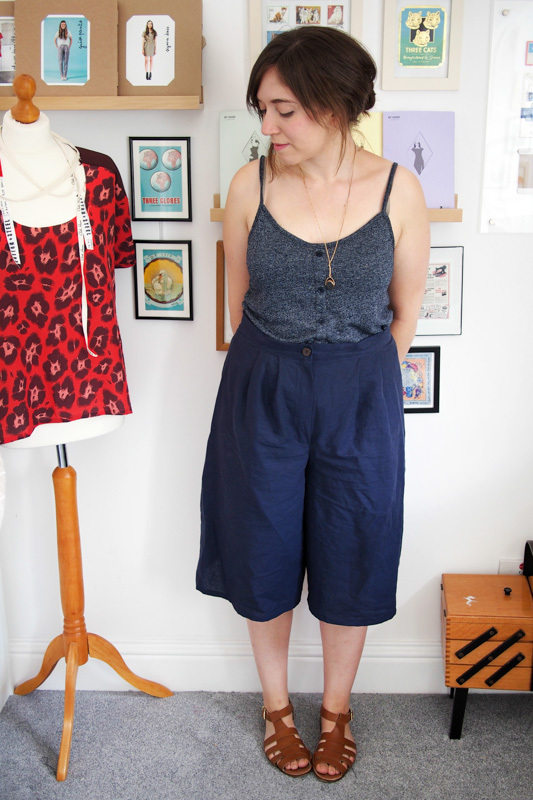 I’ve been meaning to make culottes for ages – hopefully I’ll manage to before the summer is over! Love your culottes and that vintage pattern. No way, definitely great minds. Look forward to seeing yours. 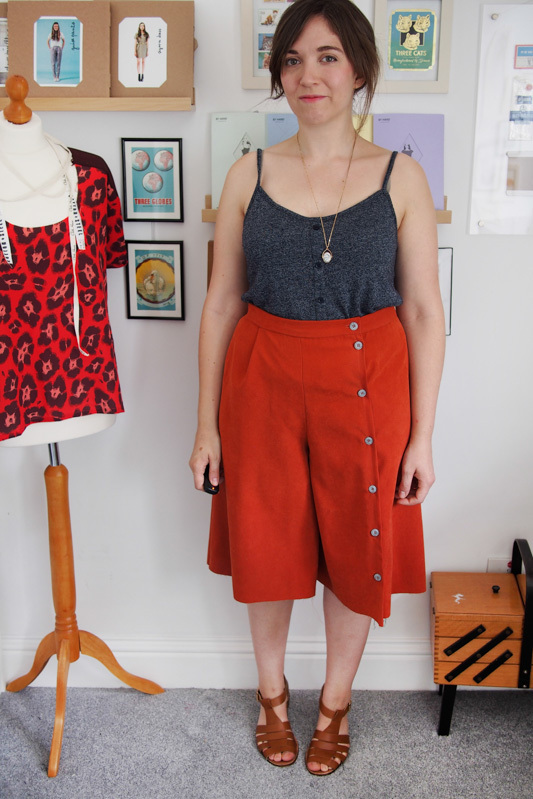 You have been a busy Sewing Bee – triple culottes! I like them all, especially the black & white ones, so chic. 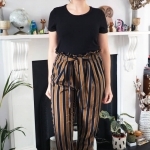 I have made a pair of culottes using a Burda Style pattern, although seeing yours has inspired me to make another pair! Burda has some great patterns – I might try one of theirs next as a change from these. So cute… especially the spot ones. I’m also sewing in threes but partly because if I can’t think up at least three versions then I don’t buy a new pattern. That’s a very good rule of thumb. I love reusing patterns. SO wearable! The last two I didn’t take off after I finished them, which is usually a good sign. I particularly like the third pair. So fast! My oldest daughter was born 1983 – now I feel ancient! They are very fast to make! I feel old now compared to all the people born in the 1990s in work, hah. I love the orange ones, how crazy those buttons there! You should take them out at a summer party and maybe if you’re not sure about them afterwards make a gift to a friend. They’re an awesome garment! Yeah, I think they are a bit much for me, I will probably end up donating them. They were just the test version anyway! I love these, especially the dotty ones! 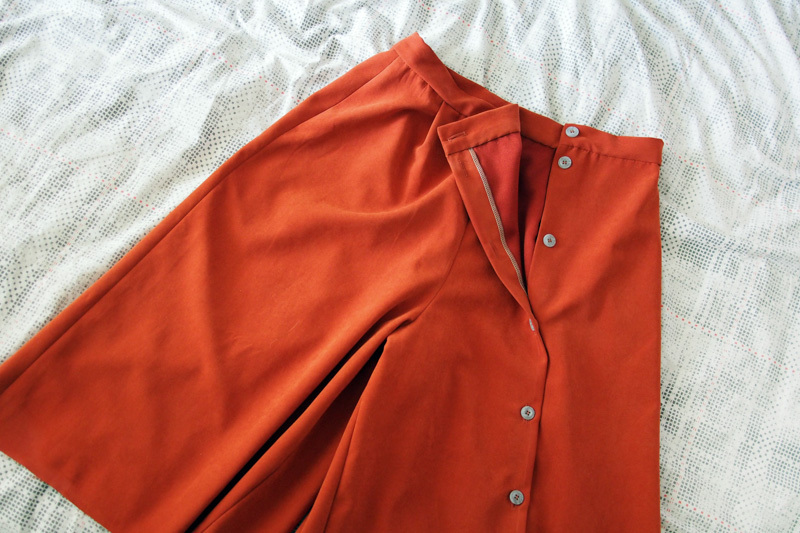 But the orange are great, too… the button detail is really lovely! Thanks! Now I just want a buttoned pair in a drapier fabric and they’ll be perfect. These are so great Katie! Bet you’re going to get loads of wear out of them. I’m wishing I owned a pair today now in stupid windy but warm but cloudy London! The recent windiness was definitely a motivation, hah. Look forward to seeing your Whistles fabric in use! 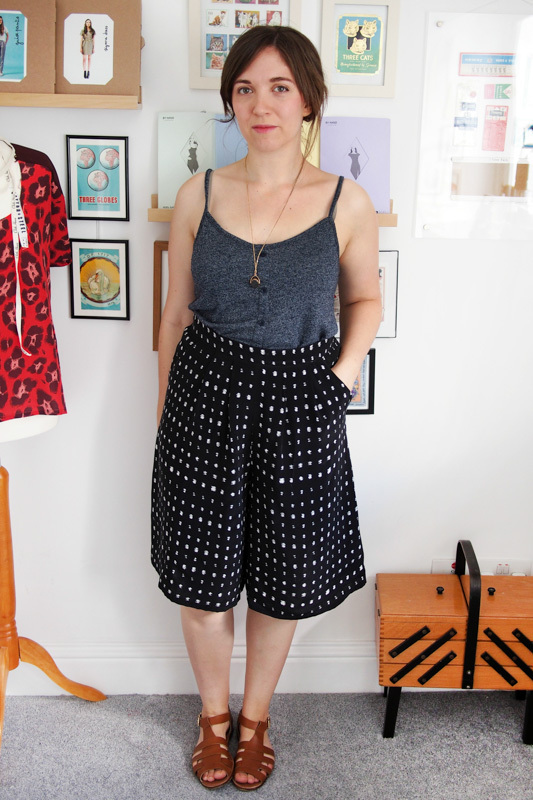 I am A FAN of your culottes! Love all three but those dotty ones are something else altogether. Perfect culotte fabric right there. 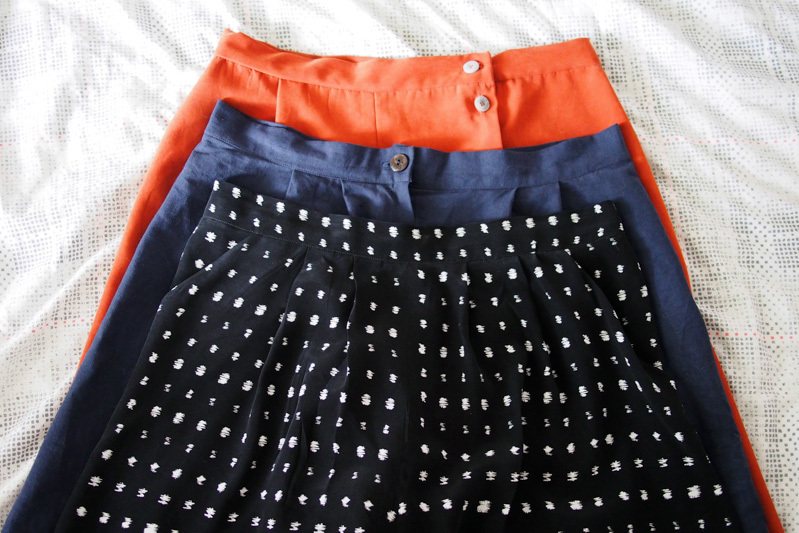 The dotties are my fave but I’m drawn to the orangie’s too…. If they’re a bit much at that length would you consider lopping them off to a traditional short length? Would look so cute with a striped top! Love these! Especially the scribbly dots! 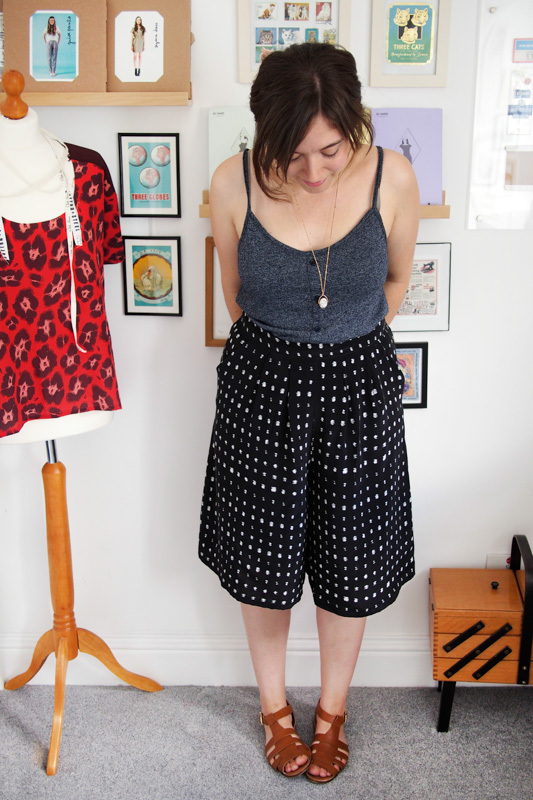 And yeah, what’s not to love about culottes?!? I thin some fun colored wool crepe would be awesome come winter! Wow quick work! I think the last pair are my favourite. What a productive weekend! I love the black and white pair. Definitely my favourite. The print is so versatile but not boring. Culottes are everywhere I look!! I like your name for them…mega shorts! lol. You are like a machine, the way you are pumping these things out so fast, The polka dot ones are my fav too. I recently saw a pair make from tencel and they draped beautifully. Those all look really cute! I’ve also been thinking about culottes. They’d probably also look amazing in a light cotton sateen or – sigh – silk! Very cute. 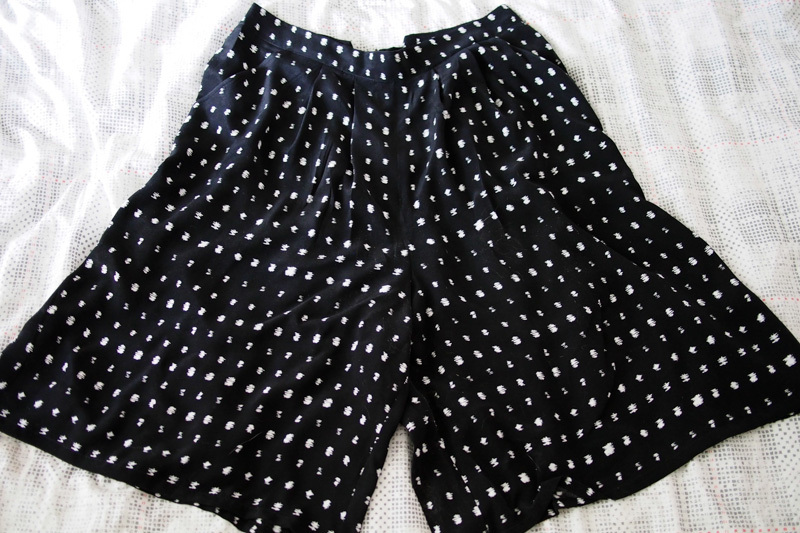 For summer I would make them in 100% rayon. So soft and hangs beautifully. It’s my new favourite fabric of choice for hot weather.